It is now (un)officially fall, which means that I can unapologetically consume every pumpkin, apple, spice, and cranberry product within arms reach without anyone questioning my sanity (and season identifying skills). So, in honor of the new season, I decided to make a fall salad and top it with some of the grilled salmon. And it was the perfect answer to all of my life’s dreams and goals. It starts with the “fall” components of the salad. Dried cranberries, sliced almonds, and some sliced green onion. Sweetness, crunch, and zip. The lettuce I used was some arugula that was hanging out in my fridge, but you can use any type of lettuce you like. Confession… the lighting was wonderful on/around my stove, so I took all my pictures on the range top. Please don’t judge me (but how awesome do the pictures look though!). Place a piece of salmon on top of the arugula. Sprinkle on the dried cranberries. Then some red wine vinaigrette dressing. This is how you make it (super easy and so yummy)! In a container with a tight sealing lid, pour in some olive oil. Then add some red wine vinegar. And a good amount of mustard, salt, pepper, and dried oregano. Put on the lid and shake vigorously! Then you have a perfect vinaigrette that you can use on everything. 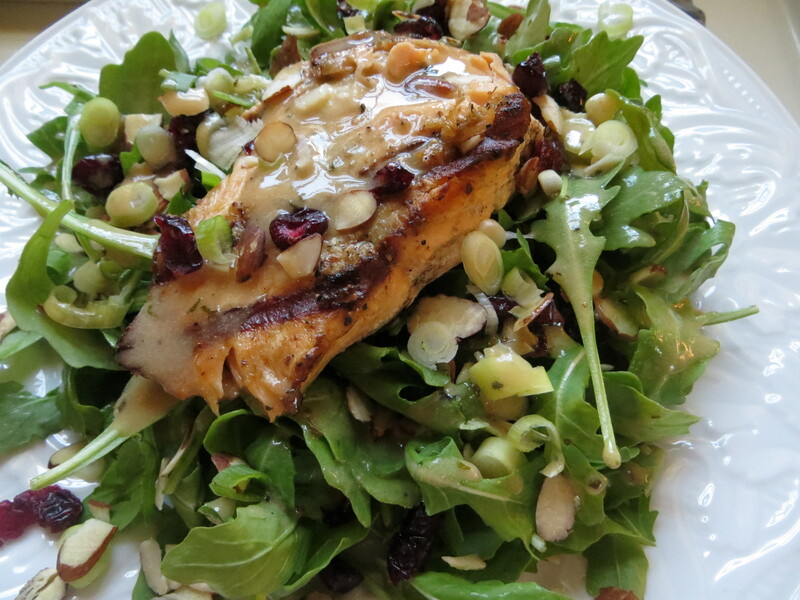 Like Fall Salad with Grilled Salmon! Combine all ingredients into a jar with a tight sealing lid. Close the jar and shake vigorously to combine. Serve immediately or keep in the fridge for 2-3 days.